Explore Cuisine is committed to fair trade and sustainable living, so that everyone benefits along the way from the field to your home. 2% of proceeds support the Food to Thrive Foundation. Explore Cuisine Searches The Globe to bring you healthy foods! Did you know bean sprouts come from Mung Beans? This shiny green oval-shaped bean has been a cherished food in parts of Asia for thousands of years. It is well known for its rich taste and especially its natural plant based protein and fibre content. 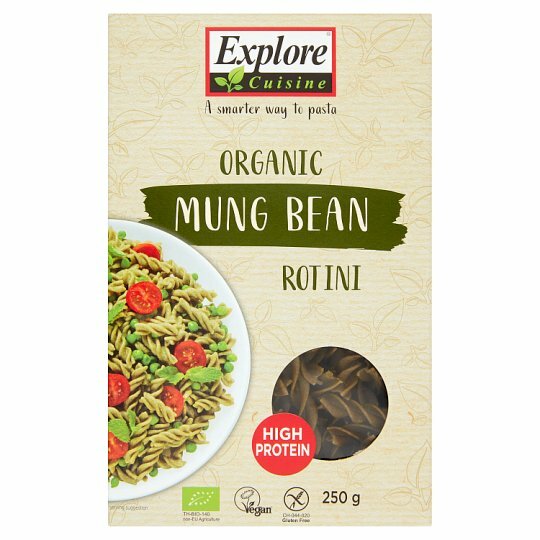 That's why the Mung Bean Rotini is the perfect fit to Explore Cuisine's range of pastas! At Explore Cuisine, we are dedicated to innovative cooking using organic ingredients of the highest quality. Explore Cuisine integrates beans, peas, lentils and rice to provide you and your family nourishing meals which are easy, quick, colourful and simply delicious. Store in a dry place and protected from heat., Best before: see bottom of package.